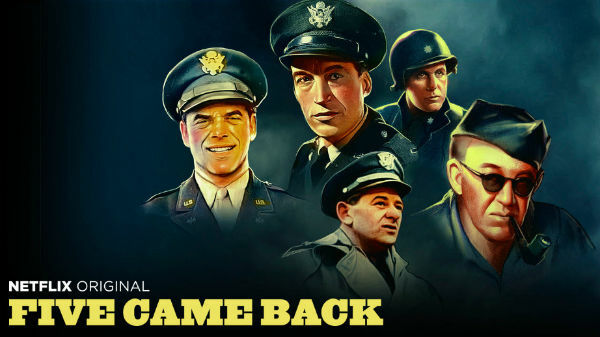 RETRO KIMMER'S BLOG: FIVE CAME BACK NEW SERIES BEGINS MARCH 31 ON NETFLIX! FIVE CAME BACK NEW SERIES BEGINS MARCH 31 ON NETFLIX! A three-part documentary based on Mark Harris’s book captures the intersection of Hollywood and history, as five pioneering directors—John Ford, Frank Capra, William Wyler, John Huston and George Stevens—applied their gifts for storytelling and film technique to produce documentary propaganda during World War II. At great risk, they traveled to the front lines in Europe and Asia, capturing footage that has stood the test of time. Executive producers are Steven Spielberg, Scott Rudin and Barry Diller. Laurent Bouzereau directs; Meryl Streep narrates.